Death is before me today: like the home that a man longs to see, after years spent as a captive. I discovered this contest today, run by Women’s Web. In homage to the female character, it asked for people to write about their favourite literary females. And I couldn’t help but think about Death. Death stumbled out of the pages of the first series in her completely irreverent fashion. After being taken through the hair raising adventures of Dream, through a world of witchcraft and mythology, we meet Death as a young girl in ‘The Sound of her Wings’, playfully interacting with her brother outside a fountain. I immediately fell in love with her – she’s perky, she’s interesting, she’s thoughtful and nurturing. She personifies all that is beautiful about life – all with a highly ingrained sense of practicality. Dressed in her signature Goth style, she brings calm to the chaos that is the world her brother inhabits. She allows him the space to ruminate, to solve the conflict within himself. She is presented as a foil to Dream – the dream world where one sleeps but returns and the after world which remains as mysterious as She. But she is delightful as a character by herself. 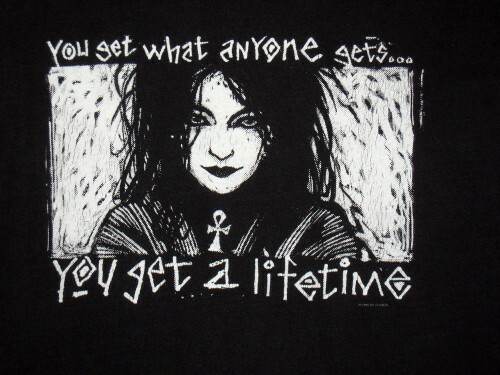 Not only does she guide spirits to the after life but also brings people to life as well. She is the first and last voice that all human beings hear. She is seen as heart-breakingly human – admitting sadness that people fear her. She is unendingly practical while being cloaked always in an air of mystery, never giving away that final secret. At the same time, she exhibits genuine concern for the people she helps cross into the after life as well as the people she meets along the way. For the fact that she is the most powerful among the Endless, she is also the most humble with a strong sense of justice. She does have a completely immovable core, aware constantly of the duty she must carry out – a fact that appeals to me more than takes away from her personality. She is the elder sister all of us wish we had. She brings an unapologetic optimism to the grim idea of death. She is completely at peace with herself. In a period of my life when I was going through some really confusing changes myself, she provided me a role model I only wish I could emulate – helping me see the humour in the grim side of life as well. 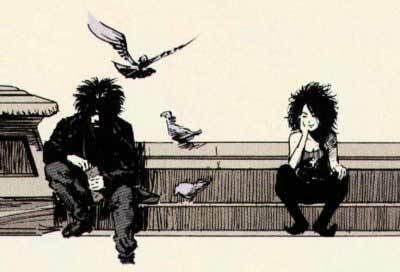 She is not the main focus of the Sandman series nor does she have a more substantial series of comic books for herself. And yet she lingers, after all these years, like the sweetest after-taste of forever. When the first living thing existed, I was there, waiting. When the last living thing dies, my job is finished. I’ll put the chairs on tables, turn out the lights and lock the universe behind me when I leave.